Slug barrier granules that provide a physical barrier around edible and non-edible plants. 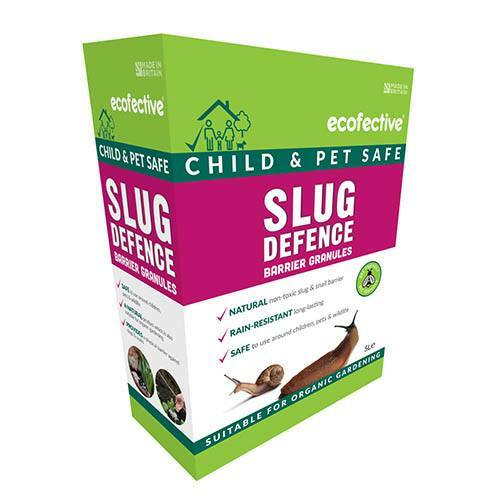 ecofective Slug Defence stops slugs and snails in their tracks. Natural non-toxic granules provide a physical barrier around edible and non-edible plants which deter slugs and snails from reaching the protected plants throughout the growing season. Child, pet and bee safe, this product is developed from naturally-derived ingredients which do not turn spongy once wet; instead they dry out quickly and remain just as effective, unlike clay repellents which degrade with rain and watering. Supplied as a 5L pack, apply a 10-15g border at 2cm high around the stem of the plant. The ready to use granules can be applied around the base of edible and ornamental plants both in the garden and plant pots, to protect against slug and snail damage. For best results use on newly planted pots & tubs. Apply a 10-15g border at 2cm high around the stem of the plant or as an even layer over tubs, planters and hanging baskets. At the end of the growing season, either dig into the garden soil, or mix into next year’s compost to help with drainage in the pots.